You are here: Home / Australia Travel Archives / A Liveaboard on the Great Barrier Reef from Cairns – What’s it Like ? 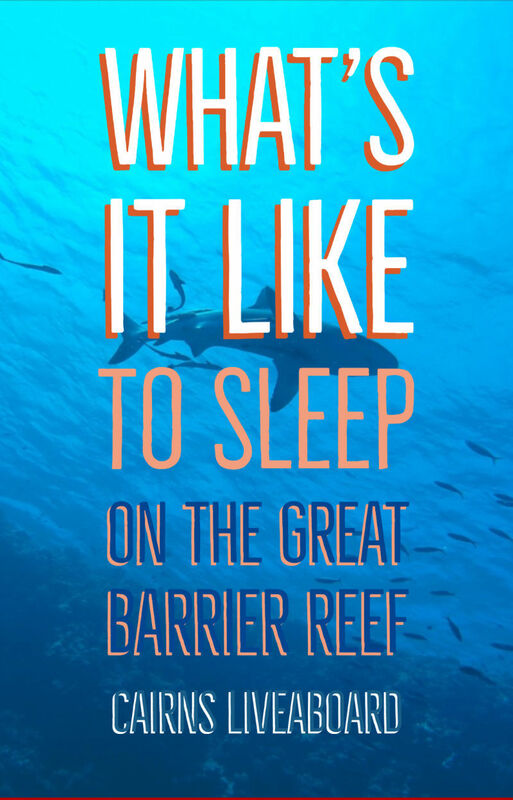 What’s it live to live, sleep, eat, scuba and snorkel on the Great Barrier Reef? We’ve taken 2 liveaboard scuba diving trips on the reef now in Queensland Australia, both departing from Cairns. But what do divers and snorkellers do out there, what’s it like? It’s the ultimate dive experience. Let us tell you more. Liveaboard scuba trips are popular with all ages, from young backpackers, to couples to families to seniors, you’ll find a real mix of people out there on the dive boats. It’s somewhat expensive, so the price tag ads a filter of elevated priority. If you’re not packing wads of cash, you have to really love the marine environment to pay for these trips. That’s rather nice, everyone out there is united by a love of the sea, all nationalities, all ages, crew and customers. Rather like trekking in the Himalayas ( our other favourite mode of travel ) you really do meet some interesting people on the liveaboards. We just got back from our second liveaboard, this time, as a family. We enjoyed 4 days fully immersed in diving and snorkelling. My husband and I are divers, our elder son became scuba certified on this trip, our younger son snorkelled. The experience of being on a liveaboard boat is active yet relaxing, invigorating yet calming. It really is a holiday like no other. Our trip was on Ocean Quest, a Great Barrier Reef liveaboard operating out of Cairns, Australia and operated by Divers Den. We highly recommend this experience. What Do You Do on a Liveaboard Dive Trip? Can You Snorkel on a Livaboard? Are Liveaboards OK for Families, Babies or Children? How Much Do Liveaboards Cost? What Do You Need to Pack for a Liveaboard? What About Scuba Diving in Stinger Season ? If I had to review Ocean Quest, Reef Quest and Divers Den I’d give them a firm 10 out of 10, I really couldn’t fault our experiences out there, nor the crew. You need to know that Reef Quest and Ocean Quest are very different experiences. Ocean Quest remains at sea, so liveaboard customers get to her via the Reef Quest day trip boat. Reef Quest is a new modern reef boat, Ocean Quest is older. Divers and snorkellers depart Cairns at 8.30 am on Reef Quest and the trip to the reef takes around 1.5 hours. 2 snorkel or scuba sessions follow before liveaboard customers transfer to Ocean Quest at 2.30 pm. That’s when Reef Quest turns around and heads back to Cairns. I would say that Reef Quest attracts more of a young backpacker crowd, but is none the worse for that, Ocean Quest has far more mixed clientelle. New Ocean Quest passengers get cake and a quick breifing before heading off to their cabins and preparing for 2 more dive sesions that day. The next day, if you have a full day, you can enjoy up to 5 more dives. If you’re transferring back to Cairns ( ie. you only have one night on Ocean Quest) you will have 3 morning dives before trasferring back to Reef Quest, again at 2.30 pm. Liveaboard diving is a scuba diver’s dream come true. You dive, eat, sleep and that’s about it. The liveaboard’s crew takes care of everything for you, you just have to get up when they knock on your door, listen to the dive briefings, gear up and dive. Buddy diving or group dives are possible. On Ocean Quest and Reef Quest group dives cost $15 Au each. It’s up to you, but I enjoy group or guided dives more. Where we had 2-3 dives at one dive site I would make the first one a guided dive then buddy dive on subsequent dives. On this Cairns Liveaboard on Ocean Quest, night dives happened daily and cost no extra. If divers wanted to take part in fluoro dives there was an additional fee for extra gear. The nightly sharks in the dark experience was fine for snorkellers, scuba divers and kids and cost no extra. On Ocean Quest you could. My younger son was snorkel only and there were a surprising number of customers out there purely to snorkel. I wouldn’t say this is the best possible snorkel experience, for that I think a smaller boats are better in shallower areas, but still, you get to sleep on the reef, watch the sun rise and set and hang out with the sharks after dark. It’s a cool experience. I was incredibly surprised to find a baby on our Cairns liveaboard. I didn’t think anyone did that. He was angelic but it did mean that his mum and dad had to take it in turns to dive and look after junior. The same would apply for all younger children. As my son was fully competent and responsible he was alowed to snorkel without us, along with the snorkel guide and group. I’m going to do further investigaton and find out if any liveaboards exist where there are actually child minding services on the boat. What About Sea Sickness on a Liveaboard ? Quite a few people on the day boat, Reef Quest, were hit by sea sickness but on Ocean Quest everything was pretty calm until a cyclone got pretty close , it was Cyclone Trevor. Dramatic skies and rough seas were spectacular but stirred up the sea and our visibility suffered. Still, nobody felt sea sick that I know of. My son did wake on his first night at sea feelg queasy, but it passed. I find that, for me, seasickness vanishes when I jump in the water. The sky’s the limit. Costs vary with degree of luxury, duration and destination. Liveaboards exist at many price points but none are particularly cheap. Scuba diving is an expensive hobby. If you’re diving or snorkelling from a liveaboard Cairns generally means hot to very hot weather and warm seas, so be prepared for tropical sun and little need to wrap up warm. We were on a 4 day 3 night liveaboard and one set of clothes would have been plenty. You’re barely in your clothes, you spend far more time in your swim wear, so one pair or pants, trousers or shorts, one top ( I’d go long sleeved because of the sun), something to sleep in and something like a fleece with some armth to it would be fine. Sunglasses are essential out there, the glare from the water can be intense. This is the brand of sunglasses for travel that we use, Sungod sunglasses review here. You don’t need to take your own dive gear, everything is provided. If you have your own gear that you like to use, sure, take it. You don’t need to take anything if you don’t want to. We had towels provided and other that a fresh water shower to rinse off the salt, we used no toiletries. Stinger Season in Cairns coincides with summer. Risk is pretty low out on the reef but snorkellers and scuba divers should be required to cover up using stinger suits. 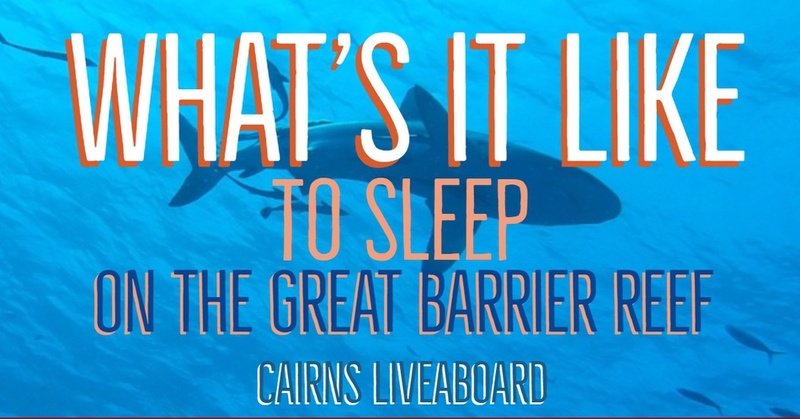 So there you go, that’s our look at a Cairns liveaboard. We absolutely want to do more liveaboard diving around the world. So you can add this sort of trip to your things to do in Cairns, ( or Port Douglas). Want more information on our region? We have a page dedicated to Port Douglas, Cairns and Tropical North Queensland.